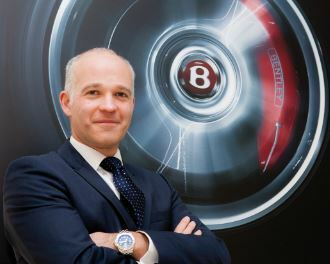 Stephen Reynolds: Bentley’s Regional Director for Middle East & Asia Pacific. How does Bentley secure continuous innovation and technological improvement? With the launch of new models in the coming years, the levels of technologies available will also increase. Our new Flying Spur for example, incorporates incredible technology with touch-screen infotainment, mobile connectivity including Wi-Fi, a rear seat entertainment suite and a new hand-held touch screen remote which allows rear-cabin occupants to control an extensive range of features from the comfort of their seat. An eight-channel, eight-speaker audio system with balanced mode radiators also provides high quality sound of exceptional clarity. We also pride ourselves in being the first luxury brand to present a plug-in hybrid and we are leading the way in bringing new powertrain choice to the luxury automotive sector. By the end of the decade, at least 90% of our production will be available as a plug-in hybrid. What efforts have been made to improve the after-sale service and overall customer satisfaction? Given the nature and level of the products we provide, an exceptional customer experience is a must and a given. For nearly ninety years, Bentley Mulliner has been personalising Bentleys, and an even longer tradition exists of employing the finest craftsmen and -women who are able to turn their talents to creating extraordinary, personalised features for Bentley owners. Whatever the customer chooses, they can be sure of their cars exclusivity. In terms of after-sales services, all Bentley customers receive a call from Bentley Motors within ten days of taking delivery of their car and after any service or repair work. This is meant to ensure that they are entirely happy with their experience and allows us to take recommendations for any possible improvements. These responses are then passed to our dealers and shared within the Bentley organisation to ensure a consistently high performance of the service we offer our customers. What geographical markets seem the most promising for the future? Our main markets – Americas, China, and Europe – will continue to be strong but increasingly we will grow our presence in areas such as Russia and Brazil. In 2013, sales were fairly evenly split between our three key regions, the Americas, China, and Europe, including the UK. The Middle East is also becoming an increasingly key region for us and sales already account for 12% of total volume. We know that in the high-end luxury sector, new models drive sales and this is why we invest heavily and continued to do so throughout challenging economic conditions. What are your core corporate values? Our Brand Vision is to be the most successful luxury brand in the world. Our aim is to deliver cars with a unique combination of luxury and performance as well as to have continuous improvement through our organisation with expertise, passion and pride. We are already the most successful Company in our sector in terms of sales but we aspire to excel in every area of our business. Our Brand Essence is Luxury Performance in everything we do and the way communicate, be it through our cars or our organisation. We continually measure how our brand is perceived and work to broaden our business appeal beyond cars and through strategic external brand partnerships such as Breitling, Pankhurst, The Bentley Home collection of furniture, the Bentley Fragrance collection and also though our Mulsanne Visionaries. How does the new Flying Spur differentiate itself? The original Continental Flying Spur was very much a four-door GT with a very high degree of commonality with its coupe stable mate. The new Flying Spur has a much more distinct identity, standing as a model line in its own right and establishing a new benchmark for luxury performance saloons. This is reinforced by its unique, sleek and elegant design language and the clear emphasis on hand-crafted luxury, comfort and refinement. What are the business lessons gained from international expansion? It is important to continually monitor world economies and to be flexible in providing the right volumes of the right cars in the right markets. The upper luxury sector is constantly growing and we are always looking to ensure that we provide our customers with the right distribution network for our cars and services. Bentley has been working to localise its work force in the Middle East what, kind of skills have you been transferring? Our dealers must adhere to the labour relations rules of the country in which they operate and employ a mix of local and international employees as appropriate to the requirements of the job. We understand that many companies have faced an uphill battle to localise their work forces is there anything you feel other companies could learn from your experiences in the Middle East? While localising the work force is an important part of our commitment to this region, it is also important that all job requirements are met. While like other brands we have faced some challenges, it is an area we see great potential in. It is important that companies think about what they can offer their employees and as much as what the local work force can offer them. Do you foresee a time when almost all your work force in the Middle East is made up of local employees? Our dealers will always recruit according to the labour policy in place at the time. However, with the mix of both local and international employees, it is important to ensure that we service our international customers, many of whom have homes and businesses in other countries, and expect us to be able to service their requirements world-wide as well as locally. As a producer of large cars, what steps is Bentley taking to lessen environmental impact? Bentley is envisioning a powerful and even more efficient future. Our commitment to this is highlighted with the Bentley Hybrid Concept – a technology showcase that previews Bentley’s first plug-in hybrid model, which is set to be a dedicated version of the all-new SUV available in 2017. As I mentioned earlier, Bentley will be leading the way as the first luxury brand to present a plug-in hybrid to the luxury automotive sector. How do you incorporate feedback from customers into future design? Bentley continues to listen carefully to our customers across the globe. Their opinions are important to us and their reaction to concept vehicles are taken in to account so that we can then refine the concept further. With the exciting news of a new Bentley SUV in 2016 do you have plans to further broaden your product range? The response from customers shows us that the demand for Bentley to offer this type of model remains very strong and continues to grow. A Bentley SUV will leverage the success of the global SUV market and is a key element of our strategy to sell 15,000 cars per year. This will balance profit and investment in the years ahead and deliver sustainable business growth. This car will appeal to all our existing markets – and has the potential to increase Bentley’s presence in new markets too. It offers a further interpretation of the all-wheel drive Grand Touring luxury Bentley – and is a natural progression for the brand. There is always the possibility we may develop other types of vehicles or derivatives but they would have to be true to the Bentley brand values of luxury and performance. It’s in that spirit that we are entering the SUV market.